Shah Rukh Khan's 'Fan' actress Waluscha D'Souza has aced her fashion game in the past few years and has been looking incredible with all of her fashion outings. 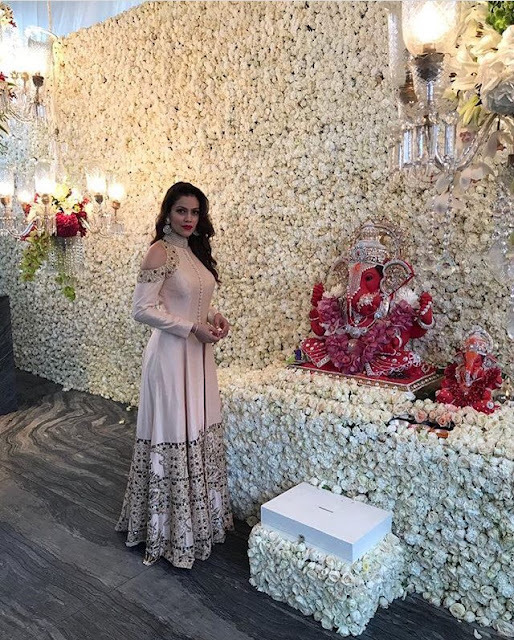 For the ongoing Ganpati festivities, she was clicked posing with the Ganesh idol at Salman Khan's sister Arpita Khan's house, against a stunning white rose and red rose over chandeliers decor that made her the image the most beautiful celebrity spotting for the festival so far. She was seen wearing a blush pink cold shoulder Anj Kreations floor length dress. It had an ethnic modest vibe to it yet looked very stylish. A touch of modernity to a traditional look is what one would adore with this avatar of hers. Furthermore, the work on the outfit is an intricate hand detailing with thread and mirror play. She completed her look with chandbalis and kept her hair open adding curls with a portion swept to one side of her shoulder.